Data are sparse on the safety and efficacy of commercially available energy-restricted meal plans in obese subjects with type 2 diabetes mellitus (T2DM). This study examined the safety and efficacy of a commercially available low-energy diet in insulin-treated obese men with type 2 diabetes. Eighteen men ≥ 35 years old who had class III obesity, had received insulin treatment for ≥ 1 year for type 2 diabetes, and had glycated hemoglobin (Hb) ≥ 6.5% were randomized to receive either a low-energy diet (N = 9) or standard medical nutrition intervention (N = 9) for 6 months. Compared with 1.5% (± 3.55) in the control group, the mean percentage weight loss in the intervention group at 6 months was 9.6% (±4.91) (p < 0.01). Complete and partial diabetes remission occurred in one subject each in the intervention group and no subjects in the control group. Mean glycated Hb levels were 8.9% (± 2.76) and 9.1% (± 1.53) (p = NS) at baseline and 6.5% (± 0.64) and 7.4% (± 1.12) (p = 0.0606) at 6 months for the intervention and control groups, respectively. Compared with 0.85 mmol/L at baseline, the mean high-density lipoprotein cholesterol (HDL-C) level in the intervention group at 6 months increased to 0.96 mmol/L (p < 0.01) while it remained unchanged in the control group. Among obese men with insulin-treated type 2 diabetes, compared with standard medical nutrition, 6 months of a low-energy diet resulted in complete diabetes remission in one subject and partial remission in another while improving diabetes control and decreasing the median daily dose of insulin in the remainder. The prevalence of diabetes in South Africa (SA) in subjects 15 years and older in 2014 was 9.5% . Obesity and physical inactivity are strong predictors of type 2 diabetes (T2DM) with obesity the more powerful of the two . Weight loss of 5–10% in subjects with T2DM who were overweight or obese resulted in a clinically meaningful reduction in fasting plasma glucose (FPG), glycated hemoglobin (Hb), and total cholesterol (TC) . Current guidelines advocate very low-calorie diets (VLCD) in obese subjects with T2DM to achieve weight loss greater than 5% in 3 months only under close medical supervision . The data supporting these recommendations are limited [5, 6]. 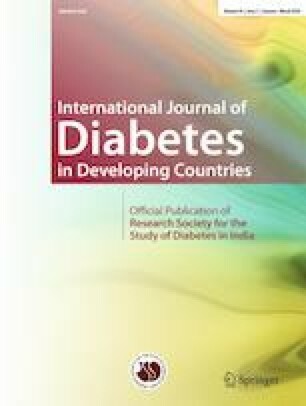 A VLCD consumed daily by obese subjects with T2DM resulted in remission of diabetes in 40% of subjects after 8 weeks . After 6 months, the responders lost 15.4% of their body weight and were still in remission indicating that T2DM is potentially reversible by substantial weight loss. Obese subjects with T2DM often resort to commercially available low-energy weight-loss programs in an attempt to lose weight and to improve glycemic control. Few studies, however, reported on the safety and efficacy of commercially available energy-restricted meal plans to reduce weight and improve glycemic control in obese subjects with T2DM [7, 8, 9, 10, 11]. Meal plans in these trials provided 1200–2000 kcal per day [7, 8, 9, 11]. Subjects in intervention groups achieved weight loss of 4.3–21 kg over 4–52 weeks [7, 8, 9, 10, 11]. Diabetes remission was not reported in any of these trials while serious hypoglycemia remains a concern [10, 11]. It has also been well-documented that initiation and intensification of insulin therapy contribute to weight gain in subjects with T2DM . The main objectives of this study were to investigate the safety and efficacy of a low-energy commercially available weight loss program in SA to induce weight loss, improve metabolic health, and induce diabetes remission in insulin-treated obese men with T2DM. This was a single-center, prospective, open-label, randomized pilot study conducted over a period of 6 months comparing the effect of a commercial weight loss program with a standard nutrition intervention in insulin-treated men with T2DM and class III obesity. The study population consisted of 18 male subjects. Women were not included in this pilot study of a small number of subjects since men and women may respond differently to rapid weight loss . Subjects were recruited by newspaper advertisement and from private practices in the catchment area of the research unit. Inclusion criteria were age 35–65 years, BMI ≥ 35 kg/m2, weight < 185 kg, T2DM diagnosed at least 4 years previously, currently managed on insulin for more than 12 months with or without oral hypoglycemic agents (OHA), and a glycated Hb level of ≥ 6.5%. Exclusion criteria were diabetes secondary to a specific disease or glucocorticoid therapy, previous bariatric surgery, advanced renal disease, a history of a previous positive HIV test, known malignancies or chemotherapy within the past 12 months, symptoms of heart failure greater than New York Heart Association functional class 2, unstable angina, and untreated major depressive disorder. Subjects continued their usual treatment, including lipid-lowering and anti-hypertensive agents. Insulin use was titrated according to capillary home blood glucose monitoring (HBGM) and carefully recorded. Subjects were assigned to one of two treatment arms by block randomization according to age (35–49.9 and 50–65 years) and BMI (35–45.9 and ≥ 46 kg/m2). Anthropometric data including weight were collected, and the 6-MWT and BP measurements were performed according to standardized methods described in detail in Appendix 1. Body composition was determined by dual energy X-ray absorbtiometry. A registered counseling psychologist (AP) evaluated each patient by administering the Duke University 32-item Impact of Weight Quality of Life Questionnaire (IWQoL) and the 16 Personality Factors (16-PF) psychometric test after obtaining the permission of the license holders. A registered dietician (SvdL) interviewed each subject and administered a food frequency questionnaire (FFQ) before and after completion of the trial to determine each subject’s usual daily kilojoule intake. Subjects were also instructed to complete a food diary for a specific day during the preceding week. Subjects were encouraged to pursue physical activity within their individual physical capabilities. Each subject was evaluated at the start of the trial by a single endocrinologist (WFM) to establish the presence of obesity-related comorbidities as well as the presence and extent of macro- and microvascular complications of diabetes. The intervention group followed a commercially available low-fat energy-restricted diet primarily consisting of vegetables supplemented with a vegetable soup-based meal plan (CSN weight loss program - in this trial without aloe-containing drink, barley grass, or green powder). Subjects were booked into a holiday lodge for the first 9 days for close observation. A counseling psychologist provided a structured 2-h daily interactive training program during group sessions spread out over eight sessions followed by an additional one-on-one consultation with each subject. The intervention entailed a 60-day eating plan consisting of six phases of 10 days each and is described in more detail in Appendix 1. After discharge from the lodge, subjects visited the research facility on a weekly basis to be weighed and to have their capillary blood glucose measurements and BP checked, their food diaries collected, and their insulin dose adjusted. Subjects were also encouraged to see the counseling psychologist individually at least once a month. A dietician (SvdL) provided each of the subjects in the control group with a balanced personalized energy-restricted meal plan aimed at weight reduction of 0.5–1.0 kg per week. The control group received the same interactive training program as the intervention group and subjects also visited the research facility weekly for assessment and adjustment of insulin dose. The primary outcome of the study was remission of diabetes defined as FPG < 5.6 mmol/L and a glycated Hb value of ≤ 6.5% at the end of the study without taking any hypoglycemic agents including insulin. Partial remission was defined as FPG ≥ 5.6 and ≤ 6.9 mmol/L and a glycated Hb value ≤ 6.5% at the end of the study on metformin only. Secondary outcomes were changes from baseline in levels of FPG, total insulin dose, glycated Hb level, body weight (BW), waist circumference (WC) and neck circumference (NC), arterial BP, resting pulse rate, 6-min walking distance, percentage body fat, levels of serum total cholesterol (TC), HDL cholesterol (HDL-C), LDL cholesterol (LDL-C), triglyceride (TG), highly sensitive C-reactive protein (hs-CRP), s-interleukin 6 (IL-6), s-leptin, and 10-year risk of coronary heart disease (CHD) based on the UKPDS risk calculator at baseline, 3 and 6 months . Changes from baseline to month 6 in the IWQoL were also determined. All laboratory tests were performed by a private South African National Accreditation System accredited chemical pathology laboratory (van Rensburg Pathologists, Bloemfontein, South Africa). Numerical variables were summarized by means and standard deviations or percentiles (depending on data distributions). The two groups were compared using t tests or Mann-Whitney tests. Within-group comparisons were made using paired t tests or signed rank tests. Nine subjects were randomized to each arm of the study. Two subjects left the control group after 3 months for personal reasons. The two most common comorbidities present at baseline were dyslipidemia (eight subjects in each of the groups) and systemic hypertension (seven subjects in each group) (Table 1). At 3 and 6 months, subjects in the intervention group achieved a mean reduction in BW from baseline of 9.0% (± 3.55) (11.6 kg) and 9.6% (± 4.91) (12.6 kg) respectively, compared to 1.9% (± 2.25) (2.6 kg) and 1.5% (± 3.55) (0.6 kg) in control subjects at corresponding time points (p < 0.01 for both between-group comparisons) (Table 2). Comparison between groups at corresponding time points: Δp value < 0.05; ΔΔp value < 0.01. Within group changes from baseline to 3 and to 6 months: *p value <0.05 from baseline; **p value from baseline <0.01. The mean glycated Hb level in the intervention group decreased from 8.9% (± 1.74) at baseline to 6.8% (± 0.65) at 3 months (p < 0.05) and to 6.5% (± 0.64) at 6 months (p < 0.01). The median total daily dose of insulin in the intervention group at 3 months (0.14 (0; 0.22) U/kg) and at 6 months (0.19 (0; 0.22) U/kg) was less than at baseline (p < 0.01 for both comparisons). Insulin was discontinued in three subjects in the intervention group during the trial compared to none of the subjects in the control group. All subjects in the intervention group, except the one who went into remission (see below), were taking metformin at baseline and continued with metformin until the end of the trial. Diabetes remission was achieved in one subject in the intervention group. Compared with 11.7% at baseline, this subject’s mean glycated Hb was 6.0% after 6 months. This subject’s mean fasting serum TG level decreased from 9.9 mmol/L at baseline to 2.4 mmol/L after 6 months. In this subject, insulin was completely discontinued after 6 weeks. The duration of diabetes in this subject was 5 years, and he had been using insulin since diabetes was diagnosed. One more subject in the intervention group went into partial remission with FPG and a glycated Hb level of 5.5 mmol/L and 6.1%, respectively, while still on metformin, which was discontinued at the end of the trial. He had diabetes for 9 years and used insulin for 7 years. The subjects who achieved either complete or partial remission of diabetes at the end of the trial reduced their BW by 15.2% and 16.5%, respectively. At 6 months, in the intervention group, mean HDL-C levels increased from baseline (p < 0.01), WC and NC decreased (p < 0.01), the mean distance covered during the 6MWT increased (p < 0.01), and the mean IWQoL improved (p < 0.01) (Table 2). The median 10-year risk of CHD decreased over 6 months in both the intervention (p < 0.01) and the control group (p < 0.05). Compared to 22 episodes in 6 subjects in the control group, 7 episodes of mild to moderate hypoglycemia were recorded in 6 subjects in the intervention group. This may reflect the more aggressive use of insulin in the control group to try and achieve normoglycemia. One subject in the intervention group developed symptomatic orthostatic hypotension and the dose of BP-lowering medication had to be decreased. Five subjects in each group complained about constipation at some stage, and this complaint featured more prominently in the intervention group. Additional adverse events considered to be study unrelated included the development of an ischiorectal abscess and subclinical hypothyroidism (one subject each in the intervention group) and unstable angina in one subject in the control group (unrelated to hypoglycemia). To the best of our knowledge, this is the first study to investigate the effect of an intensive nutrition intervention in men with class III obesity and poorly controlled T2DM and on insulin therapy. Furthermore, the effect of MNT intervention on insulin dose was not described in any detail in previous studies of this nature [7, 8, 9, 10, 11]. The weight loss at 6 months reported in this trial is very similar to that previously reported in two other commercial weight loss trials [7, 8]. The decrease in leptin levels in the intervention group was in keeping with increased leptin sensitivity associated with weight loss . Complete and partial remission of diabetes occurred in one subject each in the intervention group compared to none in the control group. None of the clinical trials investigating the efficacy of commercial weight loss programs reported remission of diabetes [7, 8, 9, 10, 11]. A number of recent studies has shown that T2DM may be a reversible condition following non-surgical intensive lifestyle intervention [6, 16, 17, 18, 19]. In our study, the median daily energy intake by subjects in the intervention group during the first 8 days of the intervention was 3674 kJ (2948; 3897) (data not shown). It is tempting to hypothesize that moderate-severe energy restriction during the first 10 days, which is the hallmark of the intervention described in this study, may have contributed to complete and partial diabetes remission in our subjects. This notion is supported by the results of two VLCD studies [5, 19]. The mean glycated Hb level of 6.5% (± 0.64) at 6 months in the intervention group was within the target range for good glycemic control  and was similar to that reported in two other commercial weight loss trials [7, 8]. Compared to baseline, the median daily dose of insulin in the intervention group was more than halved at 3 and at 6 months. The decrease in mean resting pulse rate at 3 and at 6 months in the intervention group is in keeping with the expected decrease in resting sympathetic nervous activity following weight loss  and may in part be mediated by a decrease in circulating leptin levels . The 6-MWT is regarded as a measure of cardio-respiratory fitness and disability in obese subjects . The increase in distance covered by the intervention group in the 6-MWT in our study is most likely a direct consequence of weight loss . The reduction in 10-year risk of CHD in the intervention group was mainly driven by a decrease in glycated Hb and an increase in HDL-C, while the risk reduction in the intervention group was mainly due to improved glycemic control. The effect of weight loss on systemic inflammation, as measured by IL-6 and hs-CRP levels, is complex . Weight loss studies yielded inconsistent results concerning markers of systemic inflammation [7, 8, 9, 10]. The lack of response of markers of systemic inflammation to weight loss in our study may also be attributed to the small number of subjects. This study is limited by the small sample size, the relatively short duration of 6 months, the enrollment of men only, and the drop-out of two subjects from the control group after 3 months. In addition, subjects were not homogenized at baseline in terms of metabolic variables. However, mean glycated Hb levels at baseline in our study were very similar to that reported by Distiller et al. (8.8%) for a large group of subjects with T2DM in SA before enrolment into a specialized Diabetes Management Program . The strengths of this study are that it was multidisciplinary, all subjects received insulin at baseline, subjects were assessed on a weekly basis, and subjects in the intervention group were under direct supervision for the first 9 days of the intervention. Insulin titration and usage were carefully documented. Adverse effects including hypoglycemia were also carefully monitored and recorded. The nutrition intervention described in this study and implemented under close medical supervision was safe and effective. The findings of this study should be confirmed by larger studies enrolling subjects of both sexes and conducted over a longer period. Data generated by this study add to the growing body of evidence that diabetes remission is an attainable goal in some subjects with T2DM. ATS Committee on Proficiency Standards for Clinical Pulmonary Function Laboratories. ATS statement: guidelines for the six-minute walk test. Am J Respir Crit Care Med. 2002;166:111-7. Stevens RJ, Kothari V, Adler AI, Stratton IM; United Kingdom Prospective Diabetes Study (UKPDS) Group. https://www.dtu.ox.ac.uk/riskengine/. Accessed 21 April 2018. How Does it Work |CSN|Christo Strydom Nutrition. http://csnc.co.za/how-does-it-work?. Accessed 22 Dec 2016. WFM, GM, and GJ were responsible for the conception and development of the trial protocol. WM, KT, SvdL, and AP conducted the research. WFM and KT compiled the data set, and GJ performed statistical analyses. WM drafted the manuscript, and GJ, AP, SvdL, GM, and KT critically revised the manuscript. All authors read and approved the final manuscript. This study was funded by an unrestricted educational grant by Mr. Christo Strydom, Bloemfontein, South Africa. The authors had complete autonomy to develop the protocol, conduct the research, analyze data, and write the manuscript. Author WF Mollentze was the manager of the Christo Strydom Metabolic Research Unit, University of the Free State, at the time research was conducted. The University of the Free State received partial funding for the Christo Strydom Metabolic Research Unit from CSN, the company that manufactures and distributes CSN products in South Africa. Author WF Mollentze received a speaker honorarium from Novartis within the last 3 years. Author G Joubert declares that she has no conflict of interest. Author S van der Linde declares that she has no conflict of interest. Author A Prins declares she has no conflict of interest. Author GM Marx declares she has no conflict of interest. Author KG Tsie declares that she has no conflict of interest. Informed consent was obtained from all individual subjects included in the study. Consent to publish was also obtained from all subjects in the study. Patients were weighed to the nearest 0.1 kg on a low-profile platform Detecto stand-on scale with handrails (DET 6854KGEUDHR) without wearing shoes and dressed in light indoor clothing after emptying the bladder. Height was determined to the nearest cm with an electronic Detecto measuring rod attached to the wall. Waist circumference (WC) was measured to the nearest cm in the standing position at the end of expiration with a tape measure wrapped horizontally around the waist half-way between the inferior rib cage and the iliac crest. Neck circumference (NC) was measured in the standing position with a measuring tape to the nearest cm. Body composition was determined by a single trained radiographer using a Hologic Horizon W Bone Densitometer. The 6-MWT was performed on a flat surface at the research facility according to American Thoracic Society Guidelines.1 BP was measured with a Welch Allyn Spot Vital Signs monitor three times in the right arm, which was supported at the level of the heart with a 32–43-cm cuff and with the patient in the sitting position after 5-min rest. The set of measurements with the lowest diastolic reading was used for analysis. The intervention entailed a 60-day eating plan consisting of 6 phases of 10 days each. Briefly, the meal plan during phase 1 consisted of the following: Day 1, 200 ml soup 6–10 times daily along with fruit in the form of plain fruit salad or fresh fruit; day 2, soup, fresh vegetables and one medium-sized baked potato; day 3, fruit, vegetables and soup; day 4, six bananas and one glass of skimmed milk; day 5, soup, 2 raw tomatoes with each meal and 150 g roasted beef at dinner; and day 6, soup, tomatoes, and vegetables. The soup was reconstituted with hot water from desiccated vegetables in powder form. The day 1–4 menus were repeated on days 7–10. The meal plan for the second 10-day phase consisted of half a glass of grapefruit juice one-half hour before each meal, 2–4 boiled eggs and 1–2 raw tomatoes for breakfast, while the lunch and dinner menu allowed a small portion of beef, fish (without butter) or skinless chicken, along with 6–10 glasses of soup mix each day for 6 days, followed by the menu of days 1–4 from phase 1. Phases 3–6 were various permutations of phases 1 and 2. No alcohol was allowed during phase 1. After completion of the first 60 days, participants were allowed to repeat any of phases 2–6 at their own discretion and to avoid or limit the intake of carbohydrates in the form of bread, pasta, and rice. Stevens RJ, Kothari V, Adler AI, Stratton IM. United Kingdom Prospective Diabetes Study (UKPDS) Group. https://www.dtu.ox.ac.uk/riskengine/. Accessed 21 April 2018.